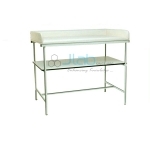 Jlab is renowned Hospital Baby Crib Manufacturer, Hospital Baby Crib Suppliers, Hospital Equipment, Hospital Baby Crib Exporter, Hospital Surgical Equipments, Hospital Baby Crib India. An baby bed, conjointly stated as a baby crib could be a little bed, specifically designed for infants and extremely young kids. 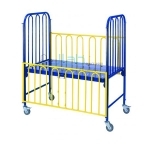 The cage-like style of baby beds orbit the kid to the bed. 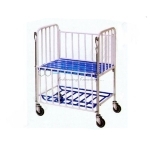 internet offers baby cribs mounted on either PVC stumps or castors in Epoxy coated soft-cast steel still as complete stainless-steel framework.Adding to the vary of baby cribs is swaddling table in soft-cast steel epoxy coated end, used for baby swaddling. Intends for babies swaddle. Upper part covered by foam-rubber and padded by leatherette. 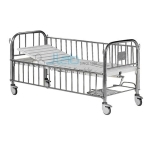 Infant Bed / Cot. Height adjustable approx. 850 - 1000 mm. Completely made of stainless steel.